Uncategorized | "How Would You Fix...?" …the reason for the Reed Richards’ Rocketship? Today’s guest post comes from Justin Zyduck, who used to write about superhero comics at the Adventures of Wyatt Earp in 2999 and was a semiregular guest contributor to Mightygodking dot com from 2009-2010. Since then he’s had two children and has retired from active blogging, but he still thinks about comics all the dang time even if he’s not writing about them. These days he writes and performs music as half of Madison, Wisconsin-based indie pop duo Evening Afternoon. He’s also published some short horror fiction under the name Justin Pollock and still works at prose in fits and starts. Everyone from J. Jonah Jameson to Jay Leno has posed that question, or some variant of it, over the years. Professional and amateur pundits alike have long debated the reason behind Susan and Johnny Storm’s presence on the historic flight that created the Fantastic Four. Feature films and other fictionalized versions of their exploits tend to portray the Storms as fellow scientists or astronauts to Reed Richards and Ben Grimm. But, in reality, they had little, if any, training in those fields. Sue Storm (now Richards) holds a bachelor’s degree in theatre, and Johnny Storm was, by all reports, an average-to-bright but underachieving high school student at that time. Beyond this seeming non-explanation, we can only speculate. Frustratingly, due to the nature of the U.S. government’s funding and involvement, official explanations and documentation on the Richards rocket project have been largely classified. In most cases we must depend on the licensed Fantastic Four comic books as primary sources. However, whether through deliberate or accidental miscommunication between the Fantastic Four and the creative teams behind the comic – or perhaps even for matters of simple artistic license – details are often inconsistent. Indeed, the very nature of the rocket itself has been inconsistently portrayed over the years. The flight was described as a mission “to the stars” in the debut issue of the Fantastic Four comic book (Vol. 1, #1.) Later retellings frequently speak only of a nebulous “spaceflight” that may or may not have involved a “hyperdrive” or “star drive.” Furthermore, the first issue presented Richards’ decision to launch the rocket without official clearance as a spur-of-the-moment impulse because “conditions are right tonight.” Only later did Vol. 3, #11 reveal that Richards effectively stole his own ship after the government withdrew funding from the project. When we don’t even know why Richards himself undertook that flight, is it any wonder that researchers and journalists have had difficulty reading between the lines to figure out what exactly the Storms were doing there? But what if, instead of trying to determine what Richards is not saying about his friends’ involvement, we were to focus on what he is saying? Perhaps it’s a dead end to read such statements as the one quoted above as merely some kind of media-friendly deflection. What if we take him at his word? A man goes into space with his three closest friends. What would it suggest about the mission? Others, however, rush to defend Richards. On a special edition of the TV news magazine Lateline, Dr. Henry Pym – a leading biochemist and founding member of the Avengers under identities such as Giant Man and Yellowjacket – stated the incident was “a freak accident. No one could have predicted it. A cosmic ray storm on the surface of the sun produced particles that reacted with the star drive” (Vol. 3, #543.) This statement suggests a singular, anomalous incident that Richards was not and could not have been prepared for, which would seem to absolve Richards at least partially of blame. The “freak accident” theory, however, while occasionally repeated elsewhere, can’t be entirely accepted because the effects of the cosmic rays have been reproduced. Specifically, rogue scientist Ivan Kragoff – alias the Red Ghost – exposed himself and his trained “Super-Apes” to what would appear to be the same type of cosmic rays, as did the terrorist group known as the U-Foes. Both teams traveled in spacecraft even less shielded than the Richards rocket for the deliberate purpose of gaining cosmic ray-derived superhuman powers. The Fantastic Four themselves have re-encountered the same or similar cosmic rays on subsequent flights. During the account of their first battle with the extraterrestrial Skrull race, a spacecraft containing the Fantastic Four passes through a “radiation belt” that temporarily cures Grimm of his condition. It is suggested that this same belt gave them their powers in the first place (Vol. 1, #2.) Today, it is commonly held that this radiation belt was the Van Allen belt, two bands of trapped particles held in place by the Earth’s magnetic field. At least one account of the Fantastic Four’s origin, in Vol. 3, #60, explicitly names the Van Allen belt as the source of their powers. We can even resolve the Van Allen belt explanation with some of Pym’s comments. As recently as 2013, space probes detected a third radiation belt, presumably created by unusual solar activity and apparently destroyed by a subsequent shock wave from the sun. A “cosmic ray storm on the surface of the sun” as Pym describes might indeed have created an additional, temporary radiation belt with unexplained properties – a “fantastic belt,” if you will – that interacted with the Richards party to alter their genetic structure. A reaction with a “star drive,” however, seems unlikely given that Kragoff and the U-Foes’ ships would almost certainly not have had the same hyperdrive on board. In any event, we can likely pinpoint the cause of the mutation as abnormal, but by no means unique, activity in the Van Allen belt. Such fantastic belts may be created and destroyed all the time. The ones that affected Kragoff and the U-Foes might have been different belts that shared a common origin with the one that empowered the Fantastic Four. At the time of Richards’ flight, however, the existence and effects of these fantastic belts would have been unknown. So, it is quite possible that the “insufficient shielding” of the rocket might have been perfectly sufficient if not for the unusual Van Allen belt activity. Still, there is the detail, again unusually consistent among accounts, that Ben Grimm warned Reed Richards about the shielding on the rocket. Many underestimate Grimm due to his gruff layman’s persona, often portrayed referring to Richards’ inventions as “doohickeys” and “whoziwhatzis.” But, his credentials in the aerospace field are not to be sniffed at. It does seem unusual that he would have been so incredibly right and Richards so incredibly wrong about the shielding. In fact, why would anyone build a rocket with anything less than the standard amount of shielding? But perhaps the shielding not being “standard” was precisely the point. Radiation shielding is bulky and expensive, and any spaceship traveling to interstellar space would require even more than conventional spacecraft. Seeking to get around this, Richards may well have used unconventional shielding. Scientists today have proposed spaceships that generate magnetic fields to block cosmic radiation; Richards may have beaten them to this notion several years ago. Therefore, Grimm’s concern in Vol. 1, #1 that “[they] haven’t done enough research into the effect of cosmic rays” may not have been referring to the cosmic rays themselves, but rather the ability of this unconventional shielding to successfully block it. Because we tend to focus on the failings of Richards’ rocket and the seeming impracticality of bringing largely untrained astronauts aboard, we tend to overlook the true marvel of its engineering: the very fact that it could be successfully operated by civilians. It was eventually revealed that Richards and Grimm were originally intended to pair with two trained astronauts identified as Burroughs and Hennessey, although those might be pseudonyms employed by Marvel Comics for legal reasons. Vol. 3, #11 shows that these two were pulled from the mission, along with the government’s funding. Yet, on short notice, Richards, Grimm, and the Storm siblings launched the rocket without clearance, without ground support, fast enough to take off “before the guard can stop them” (Vol. 1, #1.) Then, in the worst possible conditions, they navigated the rocket safely back to Earth. They achieved all this despite half their number having effectively zero astronautics training. We can attribute their takeoff and survival to luck, or we can ask a more compelling question: what if the Richards rocket was designed to be operated by untrained astronauts? Richards’ decision to include the Storms on the mission would no longer be a massive mistake, but instead a test of the rocket’s intended function. This question, however, seems to muddle the purpose of the mission at first glance. By itself, a spacecraft that can be launched and operated by a mix of professional and amateur astronauts with no outside support is a lofty goal. Faster-than-light travel is even more wildly ambitious. Combining these two parameters makes the job exponentially more difficult. Why would Richards need to build an interstellar spaceship that requires minimal training? On the same edition of Lateline where Pym described the incident in space, Dr. Herbert Eagle, former Dean of Men at Eastern State University, is quoted as saying, “When [Richards] proposed a practical hyperdrive… financial backers fought for the opportunity to invest in his prototype.” Yet, ultimately, the project was funded and pulled at the discretion of the U.S. government. With the private sector champing at the bit to fund Richards’ project, why was the government interested enough to foot the bill themselves, and again, why was a hyperdrive and the ability to be operated with minimal training a necessity? It was only after Reed Richards’ encounter with the extraterrestrial creature known as Gormuu, self-proclaimed “Warrior of Kraalo,” was declassified and published in comic book form (Vol. 1, #271) that we could begin connecting these dots. The account revealed how, some time before making his flight with the future Fantastic Four, Richards helped defeat this would-be conqueror through ingenuity and quick thinking. The incident strengthened his resolve to complete his in-progress “experimental star-drive rocket” because “this experience with Gormuu has shown [the] universe to be more dangerous than anyone ever suspected.” It seems probable, even likely, that the U.S. government agreed with Richards’ assessment, and that they agreed to finance the rocket not for research or exploration, as Richards intended, but for defense purposes: as a prototype for the next generation of military vehicle, one that could engage extraterrestrial threats. Here, the unusual requirements of the rocket start to make sense. It would be prohibitively expensive to create a military fleet of conventional spacecraft with heavy radiation shielding, each of which would require massive, highly trained crews on the ground and in the air just to take off and land. But, what about a spaceship, with cost-effective magnetic shields, operated by one or two experienced astronauts that would allow additional, minimally-trained personnel to perform other functions, perhaps even combat? Whatever Richards’ original goals for faster-than-light travel, such a ship creates compelling military implications. Why, then, would the government abandon this idea? In fact, they might not have, at least not completely. Shortly after the Richards’ flight, a lower-profile but still very unusual space launch was undertaken by Col. John Jameson – not from NASA’s usual launch site at the John F. Kennedy Space Center, but just outside New York City. This launch could take place close to a major metropolitan center, with relatively little preparation time. Jameson was not even in the rocket fifteen minutes before launch! Perhaps this unique launch received so little attention because it was overshadowed by a malfunction with the rocket and its subsequent rescue by the burgeoning vigilante Spider-Man, then known largely for his television appearances and live stunt shows. But might that rocket have been a derivative of Richards’ technology? Did the government steal Richards’ designs and then shut down his program in favor of a homegrown one? Richards might have been uncomfortable with his work being used for explicit military purposes. His own subsequent work, after all, has largely been focused on exploration, with superhuman combat used only when needed and as a last resort. We can make an even wilder speculation here, an intriguing speculation which has never been proposed before now. Consider the other unusual major military project undertaken at around the same time as the Richards project. Just what was Dr. Robert Bruce Banner working on in the New Mexico desert before the accident that transformed him into the Hulk? If the Richards rocket was top secret, Banner’s project was doubly so. The official story, as it was originally disseminated, was that Banner was studying gamma radiation for medical or genetic research. Some sources or adaptations continue to use that explanation, undoubtedly because it makes Banner a more sympathetic figure. But today, we know that Banner was actually working on a gamma-powered weapon, although its purpose has never been made clear. A “gamma bomb” would likely be considerably more powerful and considerably more deadly than any conventional nuclear weapon in history. The utility of such a weapon seems limited: most nuclear weapons research focuses on variable yield rather than just a bigger payload. Whatever your political and ethical feelings about weapons of mass destruction, harnessing this highly unusual radiation for a bomb that could only sanely be conceived of as a “use only in case of Armageddon” deterrent would seem to be an egregious waste of a potentially world-changing form of energy. But what if the gamma bomb was never meant to be used in defense or offense against another nation on Earth? What if it was a weapon designed to be used against Kraalo, or the other hostile civilizations of the universe we were only just beginning to encounter? What kind of deployment system would such a weapon require? In light of the Fantastic Four’s reputation as peaceful ambassadors representing humankind at its finest and most high-minded, it is chilling to consider that in other circumstances, the Richards rocket might have been used as an interplanetary Enola Gay carrying a gamma-powered Little Boy. 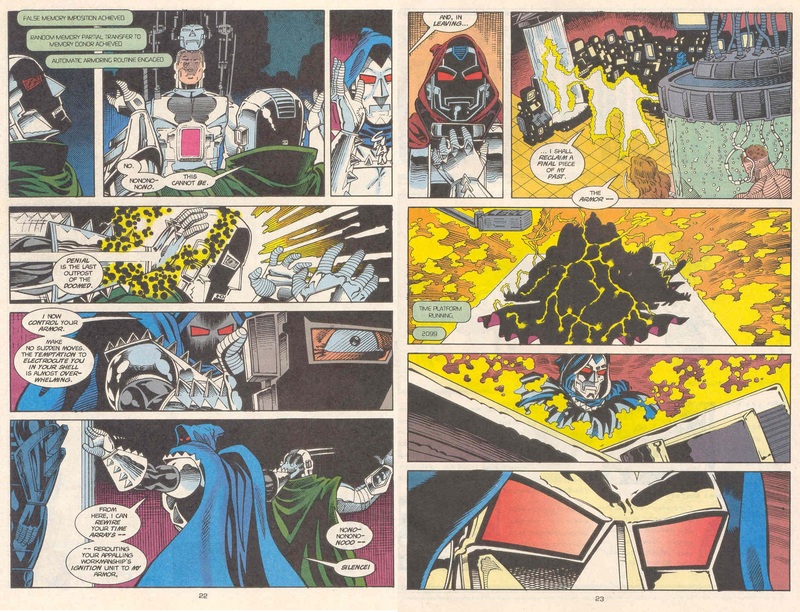 …the Origin of Doom 2099 (or “The Fate of Doctor Doom”)? In this special guest post, Victor Cardigan, admin of the 2099Bytes Facebook page and owner of a fan-site dedicated to 2099, gives you his thoughts on Doom 2099’s true identity. In the year 2099, mega-corporations rule everything. They run the United States, with each of the mega-corp CEO’s ruling their own slice of the country. Mega-Corps such as Alchemax, Stark-Fujikawa, Pixel, and D/Monix, to name a few, serve as the primary antagonists in the 2099 books. There are no heroes in 2099, at least not at first. The heroes we know – the Avengers, the Fantastic Four, Spider-Man, and the X-Men – are all gone after the end of the Age of Heroes. Exactly how that age ended is shrouded in mystery. The world of 2099 suffers from a “cultural amnesia.” Only snippets of the Heroic Age remain, distorted by the passage of time. When Marvel launched the 2099 universe in 1992, it included four characters: Spider-Man, Punisher, Ravage, and Doom. 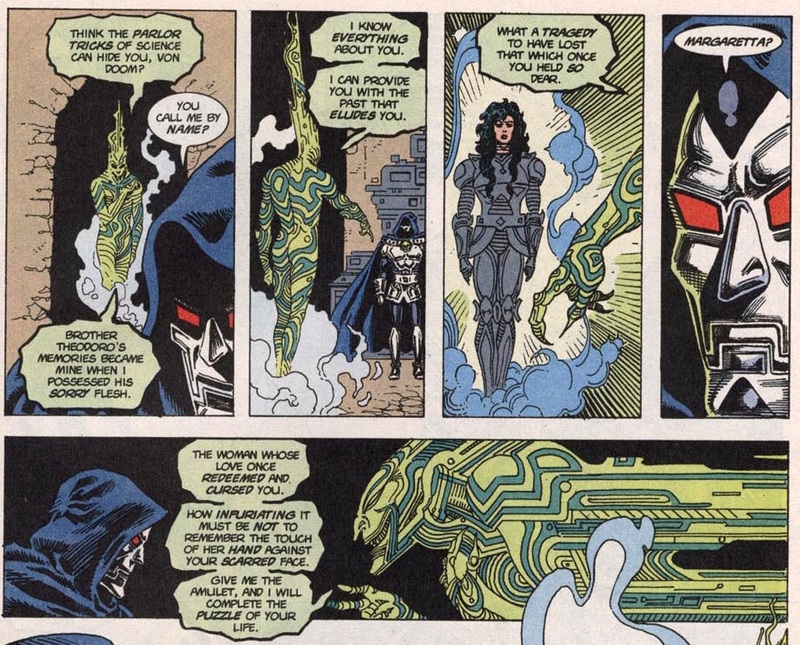 Ostensibly, Doom 2099 was the only character implied to have a direct connection to the original. In fact, he believed himself to be the original Doctor Doom. Given Doom’s penchant for time travel, a technological capability of his since his very first appearance in Fantastic Four #5, it seemed reasonable that this Doom was the genuine article. But, writer John Francis Moore threw readers a curve ball in Doom 2099 #1, planting the seed of doubt when Doom 2099 faced his first opponent, Tiger Wylde. Unmasked, Doom 2099 was revealed to be a young man sporting an unscarred face – definitely not the original. He was also definitely not a Doombot, since Tiger Wylde burned his face away, leaving him to bleed all over the office carpet. Adding to the doubts about his identity, Doom 2099 suffered from amnesia and could not account for his whereabouts prior to his sudden arrival in 2099. 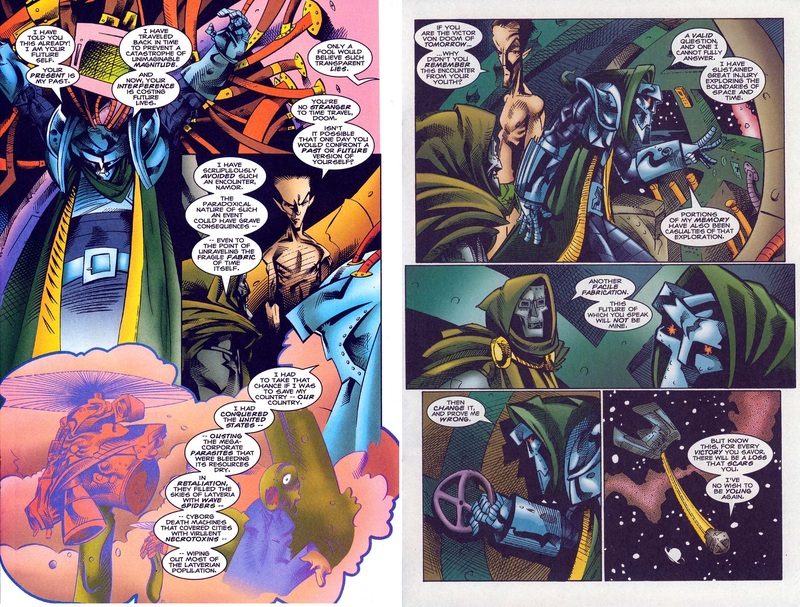 Despite these clues, Doom 2099 clearly had extensive knowledge that only the real Doctor Doom could have. For example, he knew the true purpose of an amulet he gave to Boris, his longtime friend and ally. Writer John Francis Moore teased readers with more details surrounding Doom 2099’s past in issue #2. There, we learned that Doom apparently outlived allies and enemies alike, surviving the end of the Age of Heroes. Doom, however, was still human, and age took its toll on his health. His friend Boris, apparently deceased, was replaced by Damon, who attended to his declining health. Another fragment of his past was revealed in Doom 2099 #3, where we learned that Doom’s attempt to bring unity and vision resulted in the destruction of a city or cities. Accompanied by his servant Damon, Doom concluded that to restore order he must leave. He knew where he would find answers, but readers were left to ponder where Doom went. All we knew for sure is that after his journey, whatever the outcome, he ended up in 2099. These questions were tabled until Doom 2099 #19, when Doom 2099 received a vision that made him doubt his own identity. He saw another man’s face reflected in a mirror. He saw himself seemingly tortured by the “real” Doctor Doom. Later, in issue #21, Doom 2099 received further evidence that there was another Victor von Doom in the mad ranting and ravings of Christian L’Argent. L’Argent, an Alchemax employee gone AWOL, traveled to the Savage Land in order to escape the all-seeing eyes of the Shadows who truly rule the world above and beyond the powers of the mega-corps. L’Argent identified Doctor Doom as one of these Shadows. In issue #25, Doom 2099 learned that 14 years earlier, in 2085, Erik Czerny was captured by one of the shadows he was chasing: Margaretta von Geisterstadt. Margaretta also happened to be the lover of another of these shadows: Victor von Doom. Margaretta and Doom played games, deadly games, against each other. Margaretta’s most recent scheme ended with Doom being severely wounded. She then placed Doom in a regenerative bubble to be healed. Meanwhile, she brainwashed Erik into believing he was the real Doctor Doom until the healed Doom was ready. This healing process would take fourteen years. Once he was ready, she unleashed him with Erik’s memories mixed with his own incomplete ones into the year 2099. This “origin,” however, left some questions unanswered. Certainly it remains an open question if Doom 2099 is indeed the real Doom. Margaretta, a brilliant geneticist, could easily have “grown” her own Doctor Doom. L’Argent suggested as much during the Savage Land incident. There is also the question of character: how did the Doctor Doom we know evolve into Doom 2099? After Doom 2099 was cancelled, I still wondered how Doctor Doom became Doom 2099. Although I believe them to be the same man, they are clearly the same man at two drastically different points in their life. The younger Doctor Doom is still fueled by his desire to destroy the Fantastic Four and rule the world. Doom 2099 wants primarily to safeguard his homeland, Latveria. If that means taking over the world and making it a better place, so be it. But based on what we see in Doom 2099 #25, Doom decided at some point to leave Latveria and rule the world from the shadows. How? Why? When? 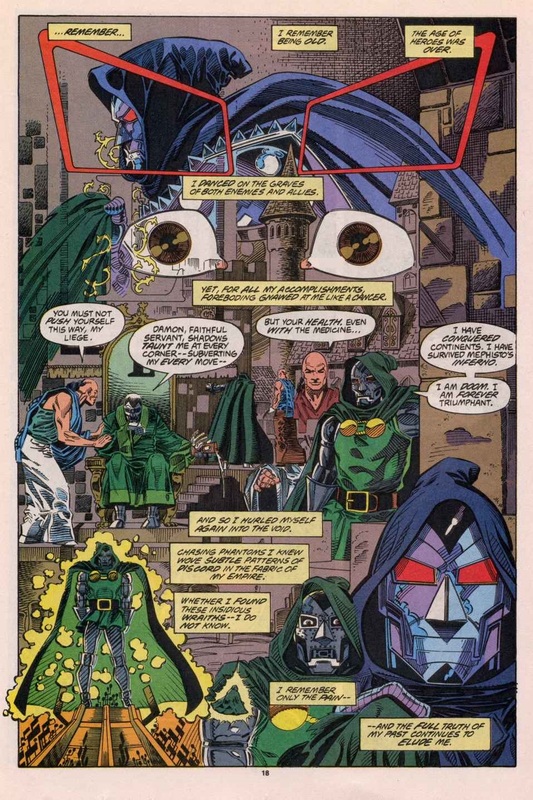 I propose that Doctor Doom made the choice to withdraw from the world and rule as a shadow king after two life-altering encounters with his own future. The first encounter was in Iron Man #250. That story showed Doctor Doom transported to the year 2093, a mere six years prior to 2099. He met and killed his future self, finding him a pathetic shadow of Doom’s former self. The Doom of 2093 was more robot than man. He lived only by virtue of the mechanics in his armor. Doom swore that this would not be his future. Yes, at the end of Iron Man #250, Merlin erased both Iron Man’s and Doctor Doom’s memories of the events which transpired. However Iron Man: Legacy of Doom showed Tony Stark breaking through Merlin’s spell to recall the events of Legacy of Doom. I propose that Doom could similarly break through the spell and recall the events of Iron Man #250 at a later date. 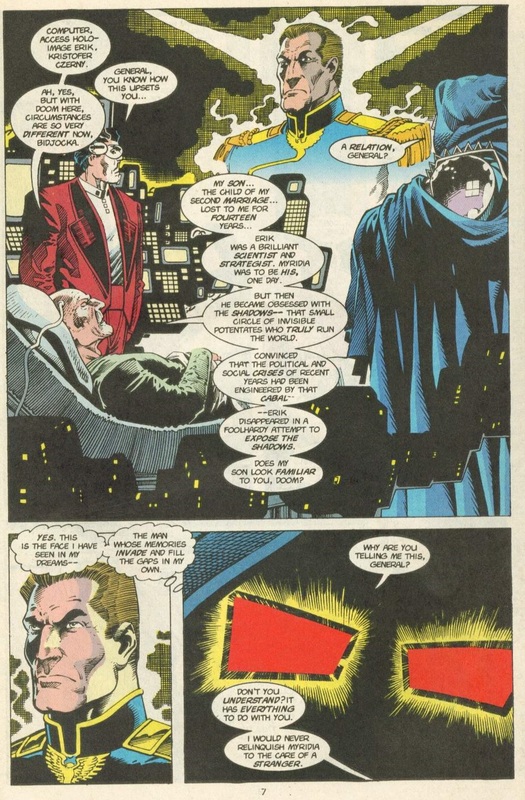 The second encounter took place in the pages of Doom 2099 itself. Issue #43 tells the story of how Doom 2099 traveled to the year 1996. During his trip, he met his past self. After learning of his failed conquest of America and the subsequent destruction of Latveria, Doctor Doom once again denied this would be his future. 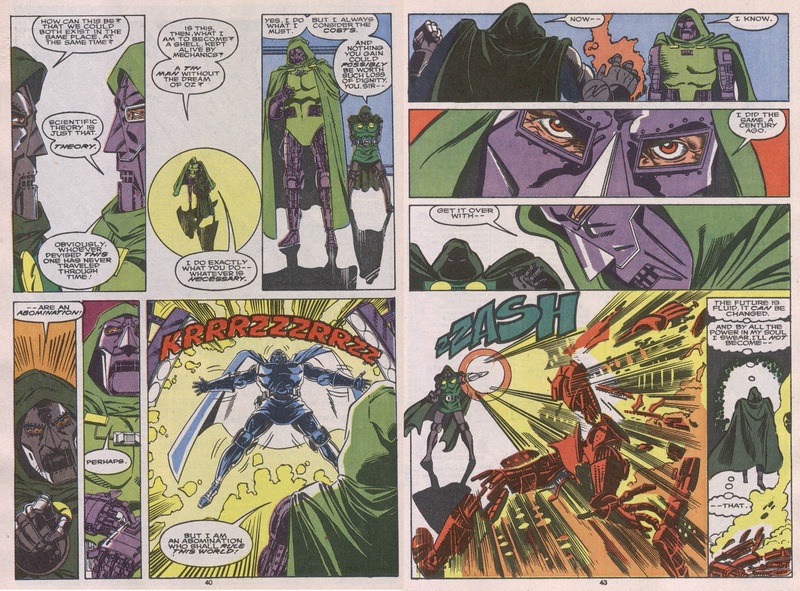 I propose these two encounters had a profound effect on Doctor Doom. They gave him important information about his future and informed his decisions on how to extend his life – and how to live it. From both encounters he learned that by the 2090s, he would still be trying to take over the world. Remember, Doctor Doom has successfully taken over the world on a number of occasions. Two things always happen. One, he gets bored. (See the graphic novel Avengers: Emperor Doom and the two-part story Super-Villain Team-Up #14/Champions #16 for examples.) Two, he is overthrown. I propose that at a future date, a unique solution occurs to him. Instead of conquering the world publically, he will conquer the world in secret and become its shadow king. Thus, Doctor Doom leaves Latveria, possibly leaving a Doombot in charge, or maybe Kristoff. Doctor Doom moves into the shadows to do his work, and he succeeds. 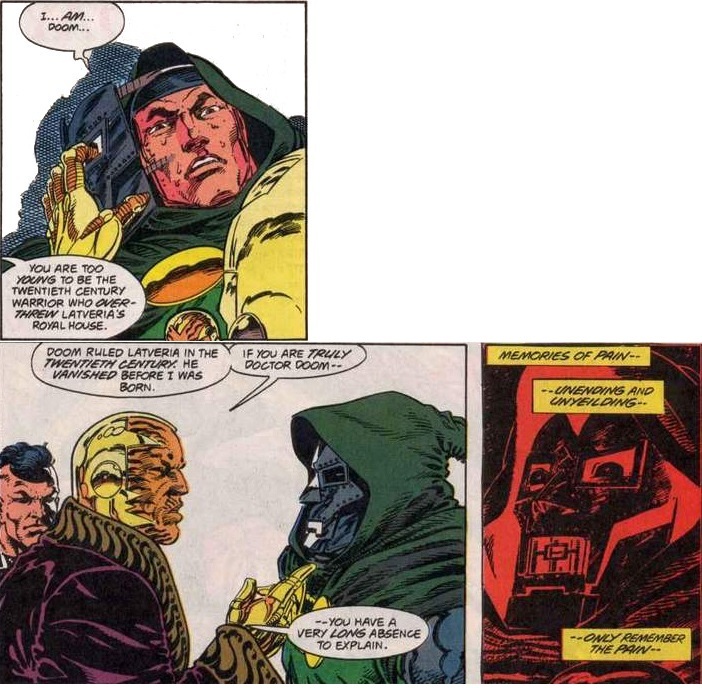 Doctor Doom quickly realizes that by removing himself from the scene, he can assert greater control over the world. Being in the shadows has its benefits. For instance, no one is trying to overthrow him, because they don’t know he’s really in charge. Also, he need not become bored with the daily drudgery that comes with being ruler of the world. In time, he discovers he is not alone in the shadows. 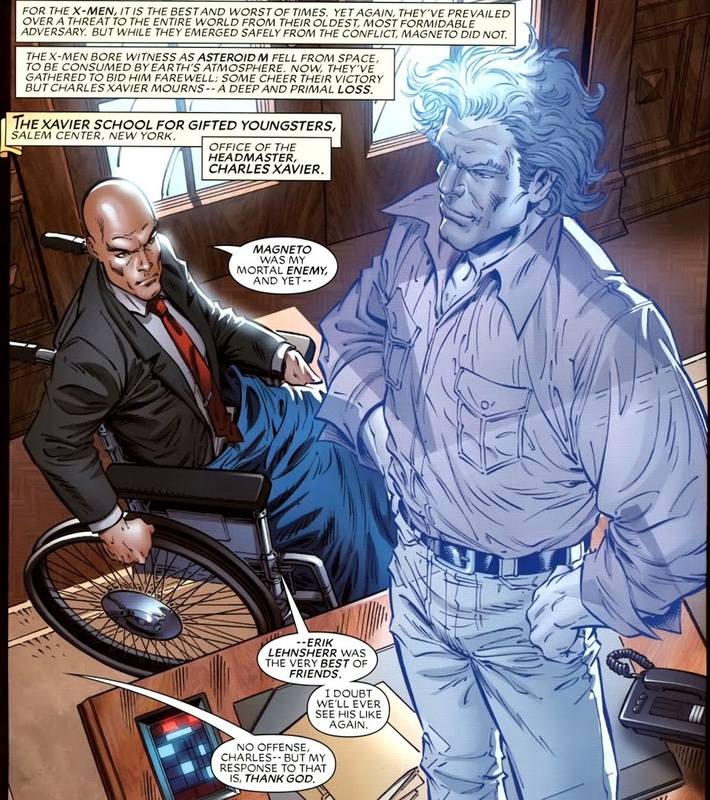 There are other such shadow kings – possibly Vulcann, Essex, and the Shaper’s Guild, all mentioned by John Francis Moore at the end of X-Men 2099. These Shadows are a loose cabal who do not exactly work together. In fact, they vie to wrest control of the world from each other. These Shadows, including Doom, push the world’s buttons from behind the scenes. It was their machinations that ignited the Pollution Wars which erupted between elected governments and the giant trans-national corporations. It was the hand of the Shadows which pulled the strings of the ruling mega-corps to hide advanced technology from the public. The world is their chessboard. Hidden from public view, Doom is no longer a piece on the board but one of the players moving the pawns. In the shadows, Doctor Doom meets a woman, Margaretta von Geisterstadt, whose intelligence is matched only by her cunning. She is a master player in the chess game of the Shadows. Where she comes from is not important. She is the last of her people, as her name implies: von Geisterstadt = of Ghost Town. She lost everything in her past because of events completely out of her control. To make up for this lack of control, she sought total control of the world. She has attained this, arguably, as a Shadow Queen. This brings us to the second part of my proposal. 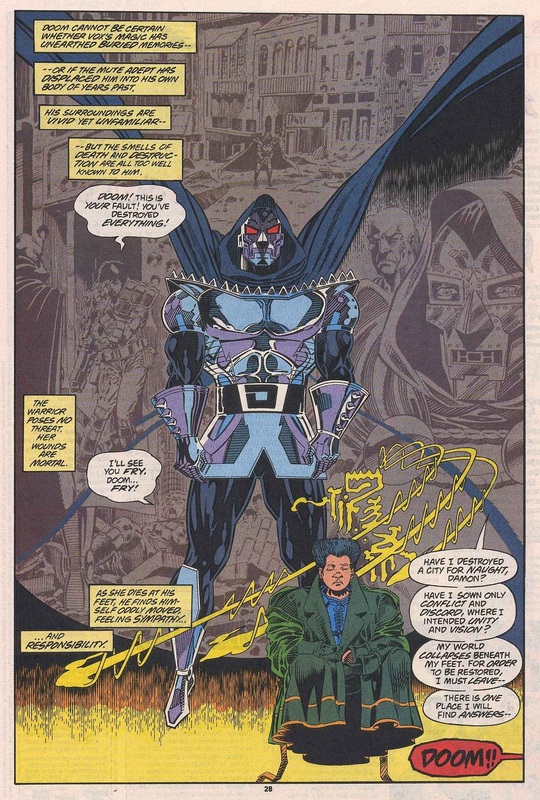 I posit that the “cancer” which gnaws at Doctor Doom in the flashback from Doom 2099 #2 was not a preoccupation with the Shadows subverting his empire. That was merely Erik Czerny’s memories bleeding into Doom’s. Rather, it was a real cancer. A human body was never meant to hold or endure being exposed to such energies. I propose that as the Age of Heroes ends and Doom survives triumphantly, his body finally succumbs to the years of torment he has put it through. Never one to lie down and die, Doom seeks options to extend his life. However, Doom is acutely aware he must be careful of the choices he makes. At all costs he wants to avoid the future he saw in Iron Man #250. Having vowed to change this future, and seeing that technology alone will not save him, Doom attempts to restore his health through mystical means. He returns to the place of his “birth” and attempts a “rebirth.” Doom travels to the Himalayas and visits the hidden order of monks who forged his first armor. In a repeat of what Dr. Strange once did for him during the Infinity Gauntlet story (Dr. Strange, Sorcerer Supreme #34,) Doom attempts to heal himself in the furnace of his birth as Doctor Doom. Unfortunately, the restorative qualities of the flames are not enough to completely cure him. They only stall his death. Doom leaves to continue his search for a cure, but not alone. 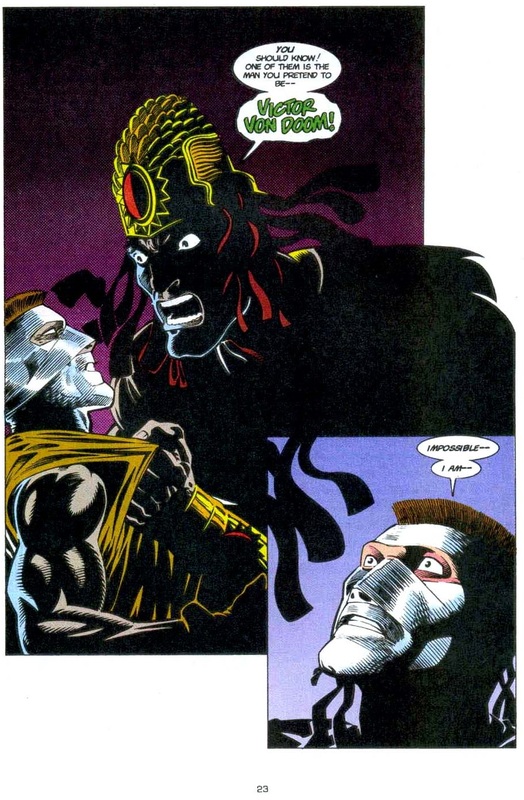 As seen in the Doom 2099 #2 flashback, he takes with him one of the monks, Damon, who administers his medicine. For his cure, Doom turns to an unlikely source: one of the Shadows. Doom has always been drawn to powerful women like Morgan Le Fey, Storm, and Dorma. It is not surprising he was drawn to Margaretta. Margaretta is likewise drawn to Doom because, in his weakened state, he is a man she can dominate. Just look at her style of dress in the flashback in Doom 2099 #25 if you need evidence that this is her type of thing. Margaretta, a master geneticist, offers Doom a cure for his illness. He promptly accepts. In this way, Necrotek’s tease about Margaretta in Doom 2099 #13 comes true: her “love” redeems him. But how does it curse him? A “cured” Doom begins an ongoing relationship with Margaretta. But, theirs is not a flowery romance. It is a game of chess, with the whole world as their chessboard. We know of Doom’s penchant for chess games from tales like Fantastic Four Special, Master of Kung-Fu #59-60, and Strange Tales #167. Doom and Margaretta’s games, like those of all who lurk in the shadows, shake and move events on a global scale. However, by 2085, it becomes clear that Margaretta’s cure is not as permanent as they thought. Doom’s condition begins to deteriorate once more. Margaretta concludes that in order to heal Doom once and for all, she requires a “clean” genetic sample of Doom. She needs a sample not tainted by the energies he exposed himself to in his public quest to rule the world during the Age of Heroes. Doom plans a journey into his own past to obtain the required sample. However, by doing this, he is inserting himself once more onto the chessboard at the mercy of Margaretta’s games. The journey into the past is a trap. Doom’s trip is diverted into a time corridor where Doom is forced to revisit his worst defeats, over and over again. The arduous flight through time ends with Doom’s arriving back at his citadel in the Pacific nearly dead. This brings us full circle to the events depicted in Doom 2099 #25 where Margaretta finds a good use for Erik Czerny while healing Doom for her next game. She mixes Doom’s memories with Erik’s and erases some of his own memories before sending him out into the world of 2099. This represents her best challenge yet for her lover. Doom, of course, overcomes her obstacles and wins the game. He is, after all, Doom. …the Molecule Man and the Beyonder? Today’s post is fnord12’s, of the Marvel Comics Chronology project. This time around, he has decided to unpick the fixes for the Beyonder’s origin, and the character’s connection to the Molecule Man, thereby weaving a logical rat’s nest into a wearable garment. So over to fnord12. Ok, ok, put the pitchforks down. I know no one wants to hear any more about the Beyonder ever again. I know we all hated Secret Wars II, and that’s fair enough. I’m right there with you. But, you have to admit the ending of Secret Wars II was pretty good. The Beyonder, we had learned, was once a universe unto himself. After he spent the series thrashing about in our universe in various ill-advised ways, the Beyonder decided to return to the void of his previous existence. He would forego his consciousness and become a new universe – perhaps even a New Universe. And that’s pretty cool. Whether you see Secret Wars II as a metaphor for Jim Shooter thrashing about and disrupting the status quo in the Marvel offices, or just a cosmic storyline full of admittedly goofy moments, the ending has a nice sense of closure. It’s a shame it got ruined when the Beyonder was brought back and “fixed” in a really weird way – actually, in two really weird ways. And that’s what I’m hoping to get at with this piece: a way to unfix the fixes with my own fix. But before we get to that, a more esoteric and personal bugaboo of mine: the handling of Molecule Man in the 1970s. Molecule Man first appeared in Fantastic Four #20 as a nerdy dweeb who suddenly had vast power and was immediately corrupted by it. This triggered the Watcher to break his personal vow to never interfere (we know it doesn’t take much) and alert the Fantastic Four. Then, the Watcher spirits him away in the end. That was Molecule Man’s only Silver Age appearance. Then, in the 1970s, things got weird. Steve Gerber brought the character back in the first issue of Marvel Two-In-One, but it wasn’t really him. It was Molecule Man’s son, which he somehow produced in the isolated dimension where the Watcher had trapped him. When his “son” comes back to Earth, he’s a much more generic villain in terms of personality. He loses his body and instead possesses whoever holds his wand. The resurrection as his son was also supposed to eliminate his inability to affect organic molecules. But, that starts creeping back in later stories, beginning with an inability to affect unstable molecules. Along the way, he also seems to become his original self again, dropping the idea that he was actually Molecule Man’s son. Then, in the early 80s, Jim Shooter brought back Molecule Man as the original Silver Age version. Molecule Man re-grew a body for himself, ditched the wand, and went back to his old nebbish self that we all know and love from the first Secret Wars. (I don’t care what anyone says. The first Secret Wars was a fun story, and Molecule Man’s interaction with the Beyonder was one of the best parts of the second series.) Molecule Man even regained his inability to affect organic materials. The Shooter story in Avengers #215-216 gave a quick hand-waving explanation about the wand possessions, but offered no explanation for the son thing or the reversal of his power limitation. That always bugged me. The Official Handbook of the Marvel Universe says something about the son being a construct he created to serve as a companion, but I never liked that. Molecule Man was never shown to be able to create something with a consciousness. It seems like a step too far even for his godlike powers. Now, back to the Beyonder. Apparently, Ralph Macchio disliked the Beyonder so much that even though the character was done/finished/caput/off being another universe where he would never bother us again, he ordered Steve Englehart to bring him back just so he could do away with him again. Fantastic Four #318-319 showed the Beyonder merging with Molecule Man so they could become a cosmic cube. Just typing that makes my brain hurt. Of course, this “fix” actually had the opposite of Macchio’s intended result. Molecule Man eventually disentangled himself from the Beyonder, or Kosmos or whatever we have to call it, and went back to his usual routine. Now, instead of having a nice finite ending, the Beyonder is free to menace the Marvel universe (and us!) without notice, as s/he did in the 2003 Thanos series. Then, we have the second, most recent, “fix” from the New Avengers Illuminati series by Brian Michael Bendis. The nearly incomprehensible third issue suggested the Beyonder was a mutant Inhuman all along. It also implied that all of Secret Wars II was just an illusion played out on an unpopulated moon out in space. It seems unlikely, considering the number of actual developments that came out of Secret Wars II, like the first appearance of Boom Boom and the curing of Rick Jones’ cancer. How could it in any way jibe with the Kosmos story? Bendis has said that he kept the story deliberately vague, so that we could interpret it however we want. I am now exercising my option to do that in a way that a) preserves the original ending of Secret Wars II while b) compartmentalizing the two Beyonder “fixes” so that we can blissfully ignore them both at once, and c) addressing my personal problem with the long forgotten weirdness of the 1970s Molecule Man. So, here we go! What if there was a mutant Inhuman? Let’s call him Kosmogar Beyondagon. (That’s a Blackagar Boltagon reference, people! Look it up!) Kosmogar, although incredibly powerful thanks to the mind-blowing awesomeness of his mutant Inhumanism, might lack and covet a corporeal form of his own. He would sense Molecule Man and secretly break into the dimensional prison where the Watcher was keeping him. He would possess the lifeless construct of a “son” that Molecule Man created and then start manipulating the guy. Eventually, Kosmogar would use their combined powers to escape, but trap Molecule Man in the wand. Throughout the 1970s, then, we really saw Kosmogar. That’s why he possesses various bodies, and why his powers are inconsistent. Eventually, though, Molecule Man subconsciously asserts himself enough to expel Kosmogar. From Shooter’s Avengers through the two Secret Wars series, we have the “regular” Molecule Man again. But, we do see Kosmogar separately at this time, taunting the Illuminati and priming them to think the worst of the Beyonder. Kosmogar plans to swoop in and steal the Beyonder’s power at the right moment, something he fails to do behind the scenes in the final issue of Secret Wars II. We could tell a whole behind-the-scenes story from Kosmogar’s point of view where we get to relive a fairly chaotic battle devoid of character moments in that issue. This story could deliver bonus fixes, like explaining why Cyclops didn’t recognize Rachel Summers using the Phoenix Force at a time when he didn’t know she was his alternate future daughter. It could explain some of the minor errors in character appearances, like the roster of Alpha Flight that appears in that issue, while also telling the story of how Kosmogar failed to steal the Beyonder’s power. We can also use the bodiless Kosmogar during the early 1980s period for other fixes as well, like explaining The Thing #3 where Lockjaw talked. The other Inhumans seemed convinced he was a real person and not a dog, but Peter David’s reversal of that had some inherent contradictions. Kosmogar wouldn’t want to risk the emergence of another mutant Inhuman, so he possesses Lockjaw long enough to make him talk and discourage Quicksilver from exposing Luna to the Terrigen Mists, and then puts it into the Inhumans’ heads that it was all just a practical joke. After Secret Wars II is over, Kosmogar starts manipulating Kubik and the other cosmic entities. He gets them to think he is the Beyonder and force him to merge with Molecule Man again – which is what he actually wants. When Molecule Man disentangles himself, Kosmogar goes on to appear in the short-lived Thanos series, where he’s put into a coma (Thanos #10). This fix keeps the real Beyonder safely away from all of the post-Secret Wars II nonsense, allowing him to have retired in peace never to be used again. Plus, it provides an explanation for the changes to the Molecule Man. If we were doing all of this in some actual comics, we could frame it around a Secret Wars III. Don’t groan! We could have all of our various sentient cosmic cubes – Kubik, the Shaper of Worlds, and, yes, the Kosmos/Beyonder – each pitting a faction of heroes and/or villains against each other for the purposes of some cosmic contest set up by the Grandmaster. Keeping it not too complex leaves room to work in all our changes. 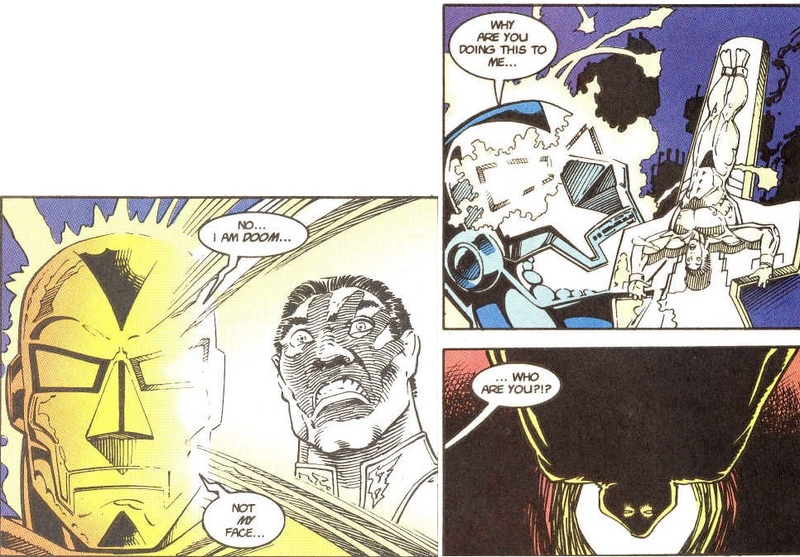 It starts to come out during the course of the story that the head of the third faction isn’t really the Beyonder. He is really Kosmos, or rather our Kosmogar. What does Kosmogar want? What was all that possession of the Molecule Man and his various machinations for? Well, that’s what Secret Wars III can be about, interspersed with some classic Secret Wars-style slugfests. We can flash back to his birth and childhood and exposure to the Terrigen Mists, seeing how he first gained his powers but also lost his corporeal form. For all his vast power, he’s been unable to create permanent body for himself. The “son” created by the Molecule Man got burned out by his energies, and he had to release all the other forms he possessed or they would have burnt out too. In order to form a permanent body, he needs truly cosmic power. The real Beyonder could have created one for him, but Kosmogar failed in that attempt. Now he needs to win the Grandmaster’s contest. But, why does he want a body? Again we go back to his childhood to find a very simple and human reason: a boy that could never receive a hug from his parents, a kiss from his girlfriend, or even pet his Lockjaw puppy. Over the years in his quest for power his mind has become more twisted, and he’s forgotten the reason for his quest. But with this, we can resolve the character arc for Kosmogar without him ever succeeding in gaining a body, as our heroes delve into his psyche and learn that, deep inside, he’s just a little boy that needed a hug. …Magneto’s resurrection after X-Men #3? The sea was a piece of red glass fading, on the eastern horizon, to a deep purple as night approached. “His colors,” thought the scarlet clad woman in the small rowboat. She maneuvered the boat towards the ancient and oddly carved jetty. The rocks were encrusted with old, dead deep sea detritus and had a weird, thrumming sensation under her gloved hand. After attaching the rope from the bow to a weathered ring, she clambored onto the large slab that led to the front gates of the citadel. From her vantage point on the jetty, she surveyed the island. It wasn’t big, and most of it was taken up by an immense citadel of outrageous proportions and esoteric design. No human hand built this citadel. Theory amongst the superheroes she interacted with was that it was a forgotten race of giants that constructed it. It had vanished under the waves long ago and had only been raised by her father a few years ago. He had made it one of his fortresses… his hidey holes. He had been missing for some time now, but if he were still alive, he might just be here. She looked out to sea. Tonight it was like glass, with only a few shallow ripples to pick up the westering sun’s crimson and gold light. “False calm…” she whispered to herself. She knew the sea was a bit more turbulent outside the electromagnetic shield that safeguarded the island… through which she had passed a short while ago. Even with a hurricane howling outside the shield, the waters herein would have only moderate waves and breezes. Her father’s doing. And obviously his devices were still active. No unsynchronized or unshielded mechanical device could operate within the shield. The Avenger’s yacht had cut out when it crossed the boundary… and had to be maneuvered back to the outside of it while they still had momentum. The Vision waited there for her, keeping the boat well clear of the shield interface. She had had to row to the island… and would have to row back, she assumed… but this mission was too important to her to abandon it. She looked up at the gold and crimson spangled walls. Something was different from the last visuals she had had of the island. “Foliage!” she muttered to herself. “There’s plants all over the walls!” That was odd, for, even though the island was situated in the Bermuda Triangle and was tropical, it had gone for years without much, if any, foliage softening its exterior and lending a feeling of life and warmth to the eerie coldness of the stones. But the island, this night, was lush with tropical growth. Greens fading to blue in the shadows, reds deepening into the rich purple that reflected the sea’s deep swells. Golds that flitted like fireflies across the rich tropical growth that hung on the walls and dangled from overhead parapets and walkways. She strode up to the towering and heavy gates and placed a scarlet gloved hand on the alien metal. It vibrated at her touch, and a darkly robed and cowled figure appeared just inside its ornamental grille. “Who goes there?” A deep and vibrant challenge. She slid into the inner courtyard and heard the gate clang shut behind her. A flash of white sparkled under the purple cowl of the imposing figure who had granted her admission. A vibrant chuckle as the tall mutant rearranged his enveloping wings that had looked so much like robes and cowl. “No, Magnus daughter… if that is who you are…” the iridescent blue/purple veined and leathery wings fell back and she saw the shock of white hair that shimmered from a scaled head and tumbled in soft waves down the mutant’s back. “I thought my father had everyone else’s power turned off on this island.” Wanda removed one of her scarlet gauntlets and held out her hand to the faerie like creature. “Sadly, no.” the giant flowed like purple water to his full height of well over seven feet. He stretched the iridescent bat like wings above him and the crimson light of the sun made them glow with jewelled color. “My Lady…” a bow to Wanda and the incredible wings spread and he lifted into the sultry air, shimmering iridescently as he rose into the stronger sunlight. “Wow… couldn’t he have just towed me out?” Wanda watched the flying man disappear almost straight up. Greensleves led down a pathway towards an interior area that, because it was sheltered by the walls, was beginning to go blue and mauve with the fading sunlight. Lush greenery spread before Wanda in generous profusion. Shimmering walkways cut through the verdant green like multicolored brick roads. All paths led to a round, Grecian temple in the center of the gardens, where a small light flickered in the growing shadows. “Right… uh… who is that?” Wanda pointed to a monk like figure, clad also in deep purple robes, entering the temple. “Yes…” and she was gone, disappearing into the twilight like the magickal creature she so closely resembled. Wanda sat and looked at the glistening sheen of polished marble. Pearly white and shimmering black and green marble. Cascades of sparkling amethyst crystals clustered and grew around the foot of a greater than life-sized figure of her father. What love created this beauty? What effort from a child, done to please someone that she, his daughter, considered arrogant and overbearing and sometimes crazy! “What did you see in him, I wonder…” she murmured to herself as she contemplated the artistry before her. She looked around and saw the old monk seated in the shadows. Maybe he could explain the dedication these people showed the very memory of her father. She didn’t want to bother him… but… he would have an outsiders view of everything. She had to ask… to try to understand. “As well as anyone…” the voice was almost a whisper but had once been a pleasant one, Wanda thought. “You were in Auschwitz…?” She didn’t know quite how to proceed. “It was not what she did… it was how and why she did it. She experimented on him to see if she could help her child. It wasn’t done for him… the benefit to him was a by-product of her experiments. Do you know how much that smacks of Mengele? Of experiments performed on him before he was a sonderkommando? Before he had the relative safety of that hated position?” the voice was stronger now… low and growling… a voice with outrage and pain in it. “It’s not like that. The Vision and I have been doing some research… and if what we think is true, it would explain all the aberrations of his behavior. It could let him control his power… and power he hasn’t even dreamed of. I just don’t know if I can trust him with the power that the knowledge would open up to him. I have got to know how he really IS. I have to know how he thinks and what he thinks… and what he really wants to do. The man shuffled listlessly… striving for a comfortable seat on the cushioned granite. It seemed as if he didn’t really care if she told him or not. “Not a word from my lips.” She smiled and turned to leave with Greensleeves and Fishface. Soon they were all lost in the deep purple haze of evening. The monk got up, stretched and walked to the front of the statue. He adjusted the brazier so that it would not go out in the middle of the night. He swept the concealing cowl back from his face and looked up at his own marble visage. Magneto smiled to himself. “Bwahahahaha, indeed.” He settled back on the cushioned slab… He WOULD sleep tonight… and tomorrow, he would greet his newfound compatriot… the sun.